Effects of the mountain pine beetle epidemic are documented in a photo collection displayed at the University of Wyoming Berry Biodiversity Conservation Center. UW alumnus Josh King took the photographs during the summer of 2009 in local mountain ranges, the majority in the Medicine Bow Range west of Laramie. The 32 photographs include portrayals of landscape views of the widespread mortality among lodgepole pine trees, close-up images of the beetles and fungi causing the epidemic, workers and volunteers removing beetle-killed pines and other subjects. 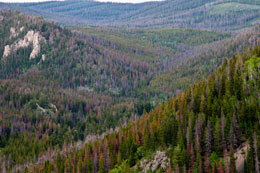 The USDA Forest Service estimates more than 3.6 million acres in Colorado and southeastern Wyoming are dramatically harmed by the mountain pine beetle outbreak. Although the beetles get blamed for killing the trees, it's actually the blue stain fungus introduced by the beetles that is fatal. The death of entire hillsides and landscapes of mature trees has implications for hydrology, carbon sequestration, safety and local economies and diminishes the forest aesthetics. King graduated from UW's American Studies Program in 2009. He became interested in the mountain pine beetle epidemic while manning the Centennial Visitor Center in the Medicine Bow-Routt National Forest. He now teaches English language learner students in Rock Springs. The collection can be seen through early next year on the first floor of the new Berry Biodiversity Conservation Center. The Berry Center is located east of the Bureau of Mines building and west of the Geology building. Visit www.uwyo.edu/berrycenter for more information.